We’re going to skip the past few days of the blog challenge in order to return to the main topic of this blog- Curly. 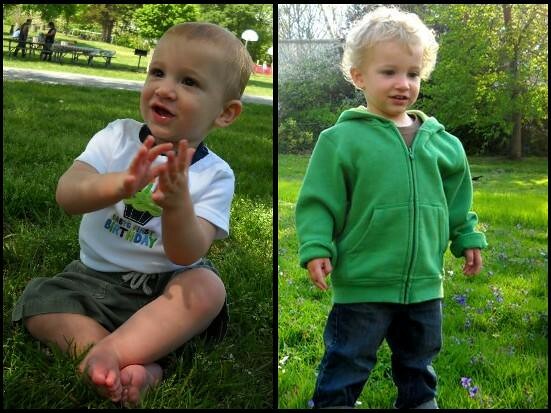 When I first started the April Blog Challenge I thought, when the challenge ends, Curly will be turning two years old. That’s in 5 days. It’s a little surreal to think that we’re going to have a 2 year old…that we’re starting to get into the counting of his years. It’s just the start (or perhaps the continuation) of time whooshing by. The passage of time goes by ever faster when you watch a child grow and change in front of your eyes. In just the past two weeks, coincidentally, Curly has started talking a lot more. He will even talk to strangers around him to point out things or show someone a “boo boo.” When we put him to bed at night, he says “Bye, Mommy…Na-night…I-uh-you.” He thinks every Muppet-looking character is “Elmo!” Now that it’s getting warmer, he spots our bare feet and fetches our shoes thinking we’ve forgotten to put them on. He cuddles with the stuffed puppy and teddy bear he sleeps with every night and converses with them in gibberish. He seems to enjoy sitting on his little potty and has even peed in it on a few occasions (to our utter surprise and delight). Whenever he hears the noise of a vehicle outside, he excitedly calls out “Choo choo!”, “Pane!” or “Copta!” Every time we put dinner in front of him, he adamantly says ‘No” but can be found finishing it all a few minutes later. His attention span for books and television is about 10-15 minutes. Sadly, his attention span for cuddling is about 10 seconds, although he’ll occasionally give us a hug or kiss out of the blue. His tantrums are short-lived and he’s gotten much better at controlling his emotions although frustration can be frequent. He enjoys showing off his toys to new people or handing them books to read to him. He loves to run around like a wild man, but will usually climb right up into his stroller if offered. He loves to point out bugs (“buh!”) and it’s a toss-up as to whether he’ll feel comfortable touching them (and putting them into the garbage at home) or watching and keeping his distance. He tries to make friends with every dog he meets. He is so different from the baby who turned one last year, and yet the same…our sweet, silly, fun-loving, observant, sensitive Curly boy. Posted on April 14, 2011 by strawberry | Enter your password to view comments.